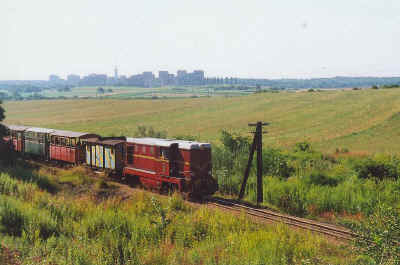 Upper Silesian Narrow Gauge Railways were the backbone of the internal transportation system of Upper Silesian industrial region since the middle of XIXth century. Hundreds miles of 785mm gauge track connected hudreds of coal mines, mills, factories and powers stations here, hosting local transportation of all cargo type ( mainly coal and ore). The private railways in the area, owned by enterprises, had the same gauge, used by specialized rolling stock. For over 100 years the railway was very lucrative. However in the end of XXth century the economy of the region, basing on heavy industry, had broke down. The post-war owner of the system - Polish National Railways (PKP) - had lost all narrow gauge clients in Upper Silesia. In 2002 community of Bytom becomes the owner of the most important part of the railway, while the Upper Silesian Narrow Gauge Association (SGKW) becomes the operator. Now here is the only one, but probably the most attractive tourist line in service: Bytom-Tarnowskie Gory-Miasteczko Slaskie. Centres of Upper Silesian cities are connected with attractive places of interest thank to stops next to Sport Valley located in dolomite mine in Bytom-Sucha Gora, Ancient Silver Ore Mine and Adit in Tarnowskie Gory-Repty and Lake Chechlo near Miasteczko Slaskie. Bytom Karb Waskotorowy is the central station of the railway. Railway Museum is planned in Bytom-Rozbark, inside monumental Repairing Workshops, the biggest narrow gauge workshops in Europe.